Since 1900, Johnson Storage & Moving Co. has been one of the largest local and long distance moving companies in the nation. 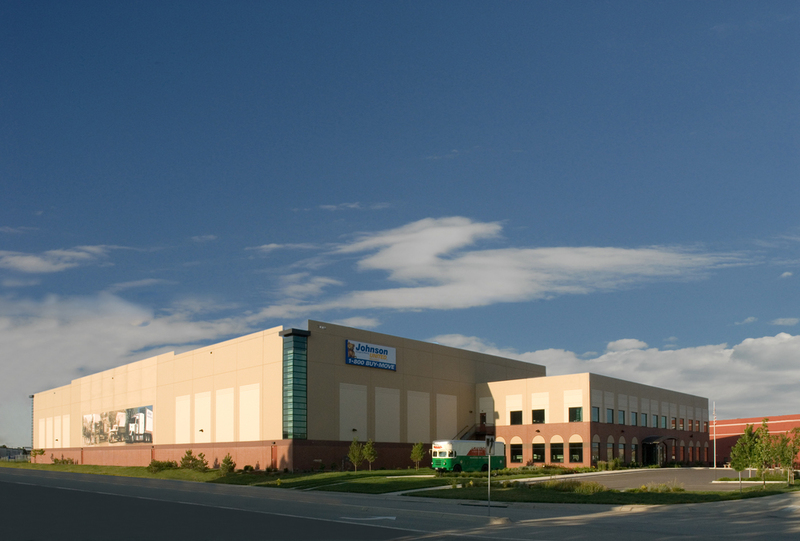 With over 400 employees, Johnson Storage & Moving has expanded from their headquarters in Denver into a network that spans over five states. With the capacity for high ceilings and large spacing for stackable, portable storage containers, the Johnson Storage & Moving facility is designed by request to also provide a corporate identity that reflects the stability and history of the organization. Due to the nature of the business, the size of the building, both in length and height, required using glass and tilt-up concrete in a design that psychologically reduces the building scale in relation to the busy street it parallels. The interior offices introduce historic photography from the early 1900’s era into a modern, simplistic décor. In the end, the new corporate headquarters provide Johnson Storage & Moving Co. with a state-of-the-art facility that accommodates for future growth and honors their legacy with a symbolic, street-side mural of the organization’s historic past.